Apple has created a new television spot featuring the Apple iPhone 4S for carriers Verizon, Sprint and AT&T. 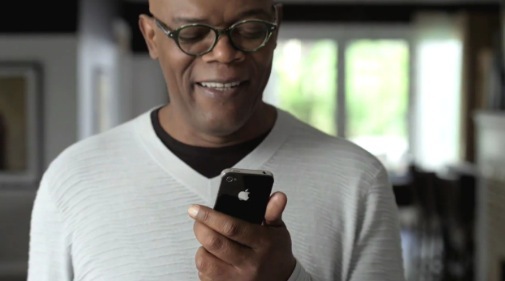 They’re Siri-focused spots featuring Samuel L. Jackson and Zooey Deschanel. The high-res versions of the videos below come courtesy of reader Peter Zich. The spots appears to be targeted at Verizon and Sprint users of the iPhone 4S. But both spots have official Apple logos, meaning that it is likely they were produced by Apple’s agency TBWA\Chiat\Day. Apple hasn’t used a celebrity endorsement in its commercials in some time, so this marks a bit of a departure for the company. Previous Verizon iPhone commercials have stuck to the regular Apple mold of ‘focusing on the device’. The Samuel L. Jackson spot was aired today during ESPN’s Sportcenter and the Zooey Deschanel spot was aired in a couple of different slots, including this evening on Fox. The videos are embedded back-to-back below. The spots have appeared with a variety of logos appended, with the carriers being touted independent of the content. Update: Apple has posted the HD versions of the videos on its own YouTube stream here. The versions above are already HD, though, so we’ve just left them. It does clear up whether the ads are produced by Apple or not, though.